Apache RV Customs is an exclusive Las Vegas, NV based custom shop, owned and operated by RV enthusiasts who love adventure and living life. We opened Apache RV Customs, for one reason and one reason only, because of people like you, who are searching for experienced educated technicians and trustworthy customer service. It is important to us that we communicate and listen to our customer's needs. We understand in this economy, when you're ask to pay a premium price, the right thing to do is to give a premium service. Our service writers and technicians have the knowledge to service and repair all makes and models, from high line coaches to travel trailers. 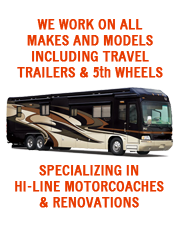 Apache RV Customs is a full-service center providing repairs, parts, custom upgrades, restoration and renovations. This will be done with true knowledge, state-of-the-art technology, luxury materials, and practical or premium features that are available today. Our goal is to rise above the standard in the RV industry by rekindling the spirit of our industry's beginnings. Our philosophy toward our customers is to do what's right, do the best we can, and treat others as we'd like to be treated. Our service is completed in a timely manner, delivered in a friendly atmosphere with a personal touch. Let Apache RV Customs help you maintain the spirit of adventure.